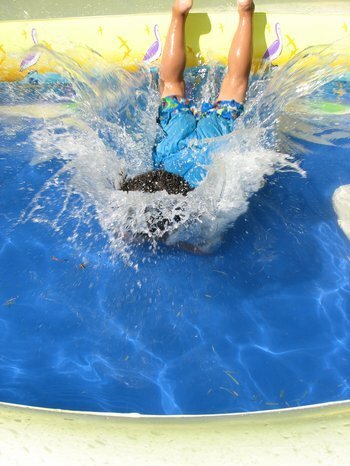 Announces the Extension of Pool Hours This Week as Temperatures Soar Toward 100 Degrees. Nassau County, NY - July 15th, 2013 - In an effort to help Nassau County residents cope with extremely high temperatures and humidity, Nassau County Executive Edward P. Mangano is extending the closing times at all of the County’s major outdoor swimming pools on Monday, July 15th, Tuesday, July 16th, and Wednesday, July 17th. The pools at Cantiague Park, Christopher Morley Park, Nickerson Beach, North Woodmere, and Wantagh Park will be open until 8:00 p.m.
“Nassau County’s outdoor pools provide residents with a terrific place to exercise, have fun and beat the heat, and with the temperatures climbing to particularly oppressive levels we’re going to provide two extra hours of relief,” said County Executive Mangano. At Cantiague in Hicksville (516-571-7056), North Woodmere (516-571-7800) and Wantagh (516-571-7460) parks, the County provides “water theme” facilities that incorporate Olympic-size swimming pools, diving pools, “kiddie” pools, interactive water-play areas and water slides. The pool at Wantagh Park, which features a beautiful waterfront location, has been named “Best Public Pool on Long Island” by the Long Island Press, the weekly newspaper. The large swimming complex at Christopher Morley Park (516-571-8113) in Roslyn-North Hills includes an Olympic-size pool, diving tank with boards, and a kiddie pool, framed by a beautiful wooded preserve. Subject: LongIsland.com - Your Name sent you Article details of "Mangano: “Beat the Heat” At County Pools"